Does the park offer special birthday packages? 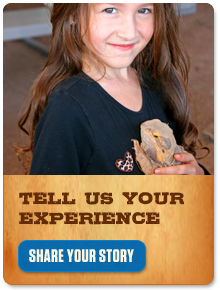 We regret that children’s birthday packages are not available at Out of Africa Wildlife Park. However, we do allow guests to store a birthday cake. Prior arrangements must be made to accommodate such requests. Tables are available on a first-come, first served basis. For the safety of the animals in our care, we ask that you do not bring balloons into our Park. Did you know anyone can visit Out of Africa Wildlife Park for only $10 each visit during the month of their birthday? Simply show proof of birth date at the admissions window, and you can enjoy the day, or month, on us!